COMBINE biscuit crumbs and butter, press into the base of a lightly greased 22cm springform pan. Chill. BEAT the PHILLY and sugar using an electric mixer until smooth. Beat in the melted TOBLERONE and liqueur then fold through the cream until smooth. Pour onto the prepared crumb base and refrigerate 2 to 3 hours until set, or overnight. COMBINE the sugar and water in a saucepan and stir over a medium heat until the sugar dissolves. Allow to boil for 3-5 minutes without stirring until golden. Remove from the heat and carefully pour over almonds that have been scattered on a paper lined tray. Allow to cool and set. 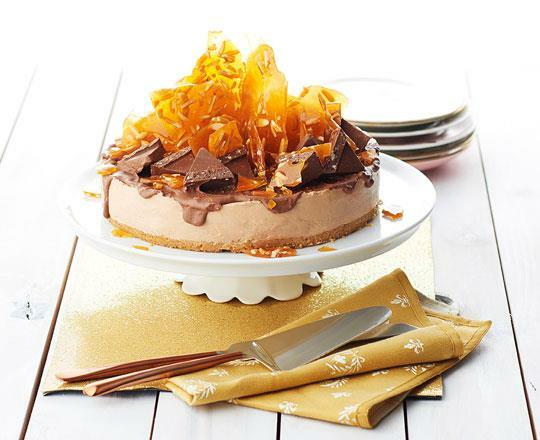 SPREAD the extra melted TOBLERONE over the top of the cheesecake, allow to firm. Break the toffee into shards and press upright into the top of the cheesecake. Decorate with extra TOBLERONE pieces. Serve immediately. Use normal A1 (household) crystal sugar to make the toffee, using caster sugar can make a toffee cloudy.